Both candidates have promised to ease the financial burden on Americans. NEW YORK (CNNMoney.com) - Tax breaks, tax breaks, tax breaks. 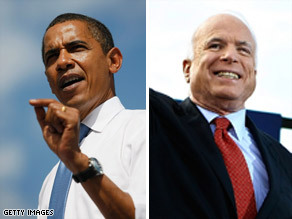 For months now, Barack Obama and John McCain have promised voters that they will lessen the financial burden on Americans – even as the economic crisis worsens and the country racks up record deficts. McCain, who wants to extend President Bush's tax cuts for everyone, says repeatedly that now would be the worst time to raise taxes. "Raising taxes makes a bad economy much worse," McCain said on Tuesday. "Keeping taxes low creates jobs, keeps money in your hands and strengthens our economy." Obama, who would repeal some of the Bush tax cuts but only for the highest-income taxpayers, says now more than ever the middle class needs help. The government HASN'T been managing the budget the past 8 years. Bush came into the White House with a surplus. He is leaving the White House with our country 12 trillion in debt. It's not just Bush's fault of course, it falls on congress too. The point is though that the budget hasn't been managed, they do keep spending more money (see "Iraq War" as a main componenet), and we owe so much to China that it's disgusting. The fact of the matter is, we have to get the deficit down now AND reduce spending on pork projects. I have made under $40,000 and I still paid taxes. I did get a refund but because I didn't have my taxes reduced. I claimed 0. Of course I would get a refund. I still paid a very high amount to taxes. It's percentage wise in proportion to income. There is still an incentive to succeed and make more money. I'm moving up in my field. I'm continuing my education. The Republicans are just looking to keep everything for themselves. They want to keep the poor poor. As long as they do then they don't have to compete with them. This is an incredible financial crisis to give to a new president, no matter who it is. They will both have to make some tough decisions–but the bigger part of this is that there will have to be sacrifices made all around. American is an instant gratification country, and when the bottom drops out, you still want to complain that now you'll have less money after living beyond your means. We need more revenue by way of tax increases–and it makes sense to give that to those who can actually pay more. John McCain does not own spending cuts and elimination of waste, Obama will look closely at the budgets and determine which are not effective and cut them. He aslo wants to make government run more efficiently so money can be spent wisely. The presidency is not a one person job, and frankly after all the reading I've been doing, I'd rather Obama take over the helm with his network of excellent advisors he will surround himself with–expecially on the economic front (Reisch, Buffett, etc). I trust that Obama understands his limitations and will make sure he has enough support to navigate many problems at once. I believe him when he says that and I trust his intelligence and judgment. I cannot say the same for McCain.